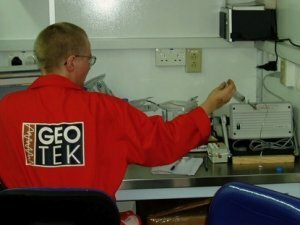 Gas Hydrate Quantification – Geotek Ltd. The best assessment of gas hydrate concentration and distribution takes place when multiple lines of evidence converge. 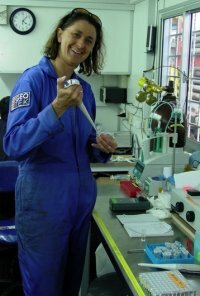 Along with downhole measurements and thermal infrared core scans, direct measurements on samples of gas, liquid, and sediment from cores are pieces of evidence that can be assembled to solve the gas hydrate puzzle. ￼Pressure cores capture and seal a volume of sediment with all its constituent parts, including any gas hydrate. The absolute quantity of natural gas within the core, whether dissolved in pore fluid, frozen in hydrate, or even present as free gas, can be measured in the laboratory through controlled depressurisation experiments. The total amount of methane or other natural gases, once measured, can be calculated and partitioned into dissolved, hydrate, and free gas phases with knowledge of the in situ conditions and thermodynamics of the system. This mass balance method is the best calculation of in situ gas hydrate concentration and is the only method that can positively confirm the absence of hydrate in a sample. Gas hydrate quantification from porewater freshening analysis is a simple idea: as gas hydrate melts, it leaves behind fresh water. If this amount of fresh water can be measured, the gas hydrate that created it can be estimated. Geotek uses intensive porewater sampling guided by core infrared imaging with the MSCL-IR to fully characterise the gas hydrate concentration and distribution in each core. Small-volume sediment plug samples and small pore water squeezer cells allow rapid sampling and processing while minimising the removal of precious core material. Freshening is measured by the dilution of the conservative ion chloride, and sulphate measurement provides assurance of the quality of the fluid sample. Baseline chlorinities, from which freshening excursions are calculated, are provided by pressure core analysis mass balance measurements. ￼While most natural gas hydrate studied has been almost pure methane hydrate, there are locations where gas hydrate can be composed of other hydrocarbons. These alternate compositions affect the thermodynamic stability and the predictions for where gas hydrate will exist in the sediment column. Gas samples are taken from core voids, sediment, or hydrate pieces, as well as pressure core depressurisation experiments, and analysed by gas chromatography to estimate gas hydrate composition and thus hydrate stability. Gas hydrate is often concentrated in coarse-grained sediment layers, if such layers are present. It is often advantageous to make this observation in real time, so that the extent of this correlation can be quantified throughout the section. 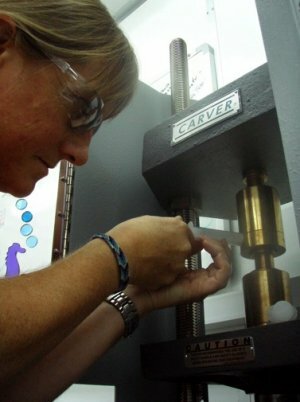 Small samples for grain size analysis via rapid laser diffraction techniques are removed from sediment plugs for porewater analysis to allow correlations of hydrate concentration with grain size. Downhole log data sets and core infrared measurements also provide information on the concentration and distribution of gas hydrate. While these data sets cannot provide quantitative hydrate concentrations on their own, they have the advantage of being more continuous than the accurate measures of hydrate concentration calculated from methane mass balance and porewater freshening. Correlation of these calculated hydrate values to the continuous downhole log data (electrical resistivity and sonic logs) or the semi-continuous core infrared measurements allows extrapolation of accurate hydrate measurements to the entire borehole. All the geochemical equipment and analyses, with the exception of the depressurisation experiments themselves, take place in a self-contained, transportable 20-foot laboratory container. This laboratory is fully fitted with lights, air conditioning, sink, uninterruptible power supplies, ethernet network, and file server. Inficon MicroGC Fusion with molecular sieve and PLOT U columns and thermal conductivity detectors. Oxygen, nitrogen, methane, ethane, propane, butane, isobutane, pentane, isopentane, hexane, and carbon dioxide analysed.